It’s great that Reloder 17 can allow shooters to boost velocities by 150 fps or more (in suitable cartridges). Pushing a bullet faster can flatten its trajectory and reduce the amount of wind drift (at a given distance). However, in our quest to shoot bullets ever faster, we must remember that higher speeds come with a price. Higher velocities can increase fouling, may accelerate throat wear, and without question, higher velocities increase recoil. How can you determine how much added recoil you’ll get when you speed up your bullets? The FREE Point Blank software program has a feature that calculates recoil. All you have to do is type in bullet weight, muzzle velocity, powder charge, and gun weight. Then the program automatically calculates recoil energy in ft/lbs and recoil velocity in fps. To use this feature, after launching Point Blank, click the “Misc Functions” tab, then select “Calculate Recoil”. Point Blank Software is very versatile. It offers a full-featured ballistics calculator that figures bullet drop and wind drift. A built-in database will hold all your load data. In addition, you can keep track of your firearms with the firearms inventory database. A target screen lets you plot shots and calculate group size. Among the miscellaneous functions, in addition to calculating recoil, Point Blank can calculate muzzle energy, “knockout factor”, and bullet sectional density. Point Blank even offers a handy English/metric measurement converter. What does all this calculating power cost? Zero. Zip. Nada. Point Blank Software is FREE. Just click on the link below to go to the download page. Point Blank will run on any PC using Windows 95 or newer operating system. Share the post "Recoil Calculation with FREE Point Blank Software"
Looking for a joystick-type front rest at a bargain price? Now through the end of August, 2008, the Caldwell Fire Control Rest is on sale at MidwayUSA for just $179.99 (product #956104). That’s a $20.00 savings. This Caldwell Fire Control Rest costs hundreds of dollars less than a Farley Co-AX or a SEB coaxial rest, though the function is very similar. We’ve tried the Caldwell. While we much prefer the more costly Farley and SEB units (they have better bases and much better bags), the Caldwell does a creditable job. Movement of the rest head is fairly smooth in all directions. The rest can be adjusted so the control arm doesn’t “droop” or move even if you remove your hand. The one knock on the product is most people think the supplied front sandbags are not good enough for competitive benchrest. But for a varminter looking for the ability to adjust both vertical and horizontal aiming point quickly, this unit should suffice. 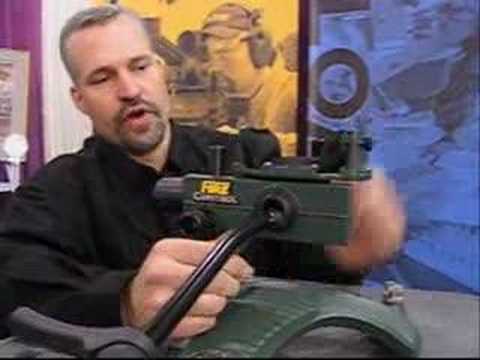 Below is a video we created at the 2008 SHOT Show. Share the post "Caldwell 'Fire Control' Joystick Rest on Sale"